This small salvia is a Californian annual, which is rather cute in its compactness. 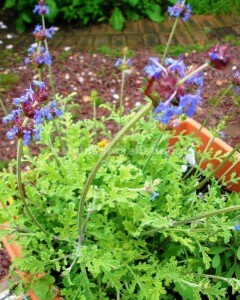 It has rather crinkled grey leaves and mauve flowers in a ball. It is grown from seed sown in autumn to mature in spring and is cold and drought tolerant. Grows best in full sun. It is not generally sold as it is an annual but passed around collectors.